Our Playground Consultant, Marion McCall, joined forces with Early Years staff at East Bergholt Church of England Primary School in Colchester, to install a range of early years outdoor play equipment to support the characteristics of effective learning. 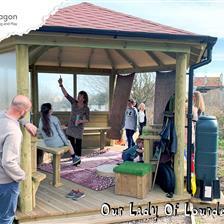 Now the children at the school in Essex are enjoying the benefits of an impressive new outdoor learning area, which has so much for them to explore. It is delightful to see that our playground installation is truly supporting the school in achieving exactly what they set out to achieve! Our favourite Mud Kitchen has been really well received. The children have been relishing making mud pies, soil cakes and “ice cubes”, mixing, measuring, pouring, playing with recipes and exploring textures and generally getting their hands dirty! It’s a resource they can really engage with in different ways, whether investigating on their own or with a group of friends, the Mud Kitchen truly provides motivation for them to get involved and have a go. The Covered Sand Table and Water Table with Lid make way for endless experimenting and exploring. When we went back to visit East Bergholt, the children were discovering objects that would float or sink in the Water Table, and playing with different tools and vessels at the Sand Table to manipulate the sand and develop their fine motor skills. View our entire range of messy play equipment here. 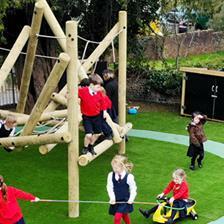 The new Climb Through Tunnel with ramp over has brought much excitement for the EYFS pupils at East Bergholt! There were lots of smiles and laughter as children enjoyed playing together, interacting beautifully as they manoeuvred themselves around the apparatus and explored different ways of travelling on it. As well as the tunnel’s obvious benefits for physical development, it’s a great resource for allowing children to think critically, using their imaginations to find different ways of climbing or sliding, using different resources to make sledges so they can go faster or slower, weighing up angles and options for exploring. The Small Playhouse was being well used for role play and social gatherings. It’s always wonderful to see children forging friendships and building an understanding of other people, different cultures and our society as they converse together in this way. They explore and act out their own interpretations of situations to better understanding them, and at East Bergholt they now have the perfect safe environment in which to do this. The option to access and choose their own resources from the new Self-Selecting Store with Whiteboard & Chalkboard Doors, has allowed child-led play to become a regular feature during outdoor learning time. It’s much more than just a secure outdoor storage facility. Children are investigating all the different resources available to them as they choose for themselves, allowing the teachers to vary and rotate resources on offer depending on learning topics, and allowing children to explore and develop their own interests as individuals. Complemented with mark-making doors, the children can develop pen control and writing skills in a fun way and on a large scale - and it’s easy to wipe down and practice again every day. As a final touch, the bold and bright Moveable Artificial Grass-Topped Seats ensure that there is always somewhere comfortable to sit when a little rest in needed. The children at East Bergholt will love sitting on these seats when it’s time to enjoy some outdoor reading, listening to their teacher, and joining in an interesting conversation. 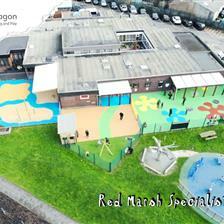 View our range of playground seating arrangements here. It’s a fabulous new Early Years Area and we hope that all the EYFS children and staff at East Bergholt will take great pleasure in enjoying its benefits all year round! If you are interested in our amazing range of Early Years Outdoor Play Equipment, please do not hesitate to get in touch with us by completing our Online Form. Alternatively, you can call 01625 890 330 (North Office) or 0117 379 0899 (South Office).